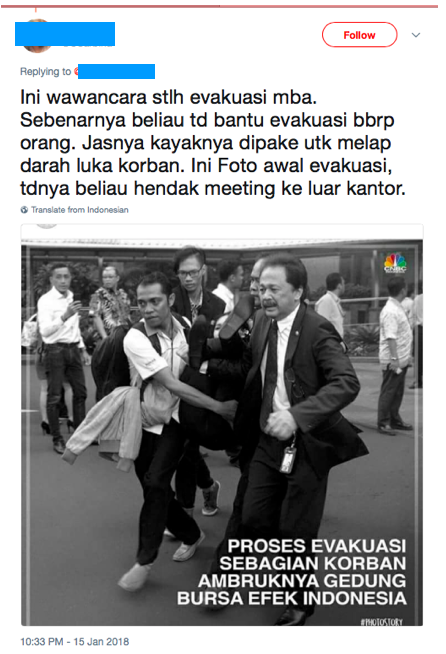 Is Indonesian Exchange President Director Tito Sulistio a callused, professional devoid of any empathy or a caring man of action who responded selflessly and bravely to the disaster when the balcony of the stock exchange building collapsed yesterday? Well, it depends on which aspect you see and base your impression of the man on. If you see how he reacted to reporter’s questions, as in the videoclip below that went viral on Twitter, you’d probably come to the conclusion that he’s insensitive, and a bit of a self-perceived macho kinda guy. That was the conclusion you’d come to when watching the video. The almost defensive insistence that the trading system is unaffected against a few injuries, gives one the impression that he doesn’t care about the injured victims and all he’s concerned with is that the trading resumes. Visually he had a couple of buttons undone on his shirt and a gelang (bracelet) that is more associated with preman than professionals (The parking attendandant at Beautika on Jalan Moestopo sports one as well). But there is more than meets the eye with Tito. Apparently he was looking a bit dishevelled in the interview because he had been busy helping carry victims to safety and, according to the Twitter user below, had had his jacket on but had used it to wipe the blood from the would of one of the victims. So it seems that his unkempt look came because he was too busy attending to the victims rather than his looks. So there we have it: the appearance and the reality. Which should public office holders prioritize in emergency situations? Both, is the answer. The reason is that the thousands and maybe millions of people out there who have no easy and thorough access to information will judge Tito and the IDX based on what he says, and how he says it, to reporters. They will see only what is on a videoclip or television segment and react from there. On this score Tirto and the IDX seems ill prepared. He should have expressed sympathy for the victims, explained to the best of his knowledge what happened, why and what he plans to do about the situation. This is called the 3Rs of crisis communications – Regret, Reason and Remedy. Anything less than three elements in a crisis-like situation and the audience is likely to come to the wrong conclusions about your motives, sensitivity and ability to bring things under control. The visual cues the spokesperson sends during his media interview, even door-stop ones, are also important. If he has to stop to speak to the media he should be trained to ensure that he looks composed and in control. He may roll up his sleeves but a couple of buttons undone sends the wrong signal. And that bracelet. Tirto needs to ask himself what signs that sends out, even in non-crisis-like situations. Some would say that it’s not fair to expect him to be mindful of being media savvy in such a turbulent moment, but hie is in public office and during moments of crisis or disasters the public needs people like him to stand forth and point the way. It is not fair but that is one of the demands of high office. Its not fair but its life. Like it or not, one has to deal with it.